"Their reign begins." This is awesome!! A fan has recut and edited the first trailer for Michael Dougherty's Godzilla: King of the Monsters, first released at Comic-Con this year. He has remade the trailer to look and play like a vintage 1960s Japanese trailer for a Godzilla movie from then and it's pretty much perfect. This sequel to Gareth Edwards's Godzilla reboot from 2014 is directed by Michael Dougherty (Trick 'r Treat, Krampus), with Godzilla battling other mythical massive monsters, including Mothra, Rodan, and his ultimate nemesis, the three headed King Ghidorah. It's going to be epic. Dougherty's Godzilla: King of the Monsters stars Millie Bobby Brown (from "Stranger Things") plus Bradley Whitford, Vera Farmiga, Sally Hawkins, O'Shea Jackson Jr., Kyle Chandler, Charles Dance, Zhang Ziyi, Thomas Middleditch, with Ken Watanabe. I really love it when these kind of fan edits turn out this good. Enjoy. You can still watch the original Comic-Con trailer for Godzilla: King of the Monsters here, to see even more. 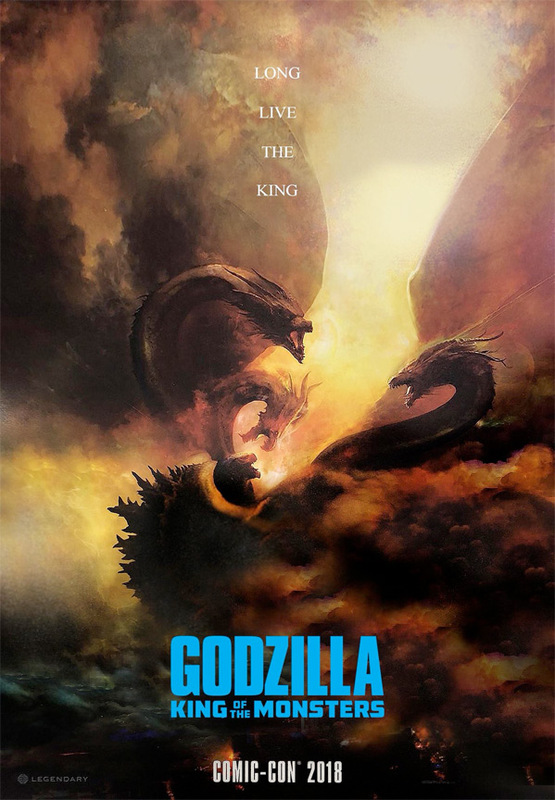 The new story follows the heroic efforts of the cryptozoological agency Monarch as its members face off against a battery of god sized monsters, including the mighty Godzilla, who collides with Mothra, Rodan, and his ultimate nemesis, the three headed King Ghidorah. When these ancient superspecies, thought to be mere myths, rise again, they all vie for supremacy, leaving humanity's very existence hanging in the balance. Godzilla: King of the Monsters is directed by American filmmaker Michael Dougherty, director of Trick 'r Treat and Krampus previously, and screenwriter on the early X-Men movies. The screenplay is written by Max Borenstein, Zach Shields, and Michael Dougherty. Warner Bros will release Godzilla: King of the Monsters in theaters everywhere starting May 31st, 2019 next summer. How does this trailer look?